Just spotted this yesterday on the approach to Knippels Bridge over the harbour. Rumble strips for bicycles. The reason is simple. The curb between the bus island and the bike lane is low here, only a couple of centimetres. Low enough for a cyclist not to notice but just high enough for it to catch a wheel, sending the cyclist tumbling onto their bottom. So... rumble strips. There is a lot of traffic on this street - 20,000 bicycles a day - so in the morning rush hour there are certainly bicycles spread out wide, close to the curb. 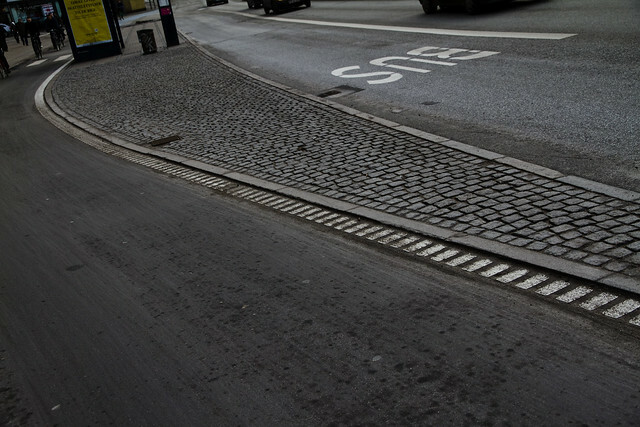 And speaking of bus islands, this is a common feature in Copenhagen. At the top right you can see a zebra crossing for pedestrians/bus passengers to use to cross the bike lane when the coast is clear.